A mule for the eighth-generation Volkswagen Golf has been spotted testing in public beneath the cut-and-shut body of a current-generation car, with new cabin infotainment and different centre console buttons. The sighting, which also presented our spy snapper with an opportunity to photograph the car's four-cylinder engine, comes three months after VW board member for procurement Ralf Brandstätter said that the next Golf was at an advanced stage of development. In fact, development has been under way for more than two years now, with key aspects of the Golf already described by high-level VW sources as having committed project status. Despite the upheaval brought to its operations by the diesel emissions scandal and subsequent legal complications in key markets, VW has held firm to the original launch schedule for the car. That means volume-selling versions of the new Golf are planned to reach UK showrooms in the final quarter of 2019. Although the first sighting provides us with no clues as to how the car will look, an earlier sketch (below) released by VW suggests the car will retain the wedge shape of its most recent forebears. Our new test mule sighting adds to this by indicating that the cabin will take an evolutionary step forward, with a larger digital instrument cluster and new centre console part of the available upgrades (more of which below). VW has laid the foundation for cylinder shutdown and engine-off coasting functions in the turbocharged 1.5 TSI Bluemotion petrol version of the updated current Golf through the adoption of a twin 12V electrical system. Now Autocar can confirm that VW is set to take the fuel-saving technology one step further. The company is planning a more contemporary 48V system that will enable the Mk8 Golf to be more comprehensively networked for more intuitive operation and greater fuel savings, particularly with petrol versions. The adoption of this electrical system indicates that VW is placing greater emphasis on petrol units than in past generations, with functions such as cylinder shutdown and engine-off coasting set to become standard on many models. The current Golf benefits from VW's semi-autonomous Traffic Jam Assist system, which controls the steering, acceleration and braking of the car under 37mph, so it's certain that the Mk8 model will take a leap in advancement over this. Elsewhere, the Audi A8 is the first car in the wider VW Group to achieve Level 3 autonomy where permitted. With VW’s ID electric line-up on the way, the eighth-generation Golf will have a range of petrol, diesel and hybrid powertrains. On the petrol side, the entry-level car will forgo the existing turbocharged 1.2-litre four-cylinder engine of today’s model for the lighter turbocharged 1.0-litre three-cylinder unit already launched in the latest Golf. The existing turbocharged 1.5 TSI engine, which made its debut as a replacement for the 1.4 TSI in the facelift, is set to be upgraded with a particulate filter. The move aims to provide lower exhaust emissions to help achieve the European Union’s prescribed 95g/km fleet average CO2 levels by 2020. With the new cylinder shutdown and coasting functions, the updated Mk7 Golf 1.5 TSI Bluemotion petrol has claimed average CO2 of 104g/km. Diesels will include a yet-to-be-revealed 1.5-litre four-cylinder unit as a replacement for today’s 1.6 TDI. There will also be an updated version of today’s 2.0 TDI in at least three power outputs. Both diesels will be coupled with a newly developed SCR (selective catalytic reduction) system that is claimed to contribute to a 10% reduction in CO2 levels compared with today’s diesels. Secrecy surrounds VW’s hybrid plans, although supplier sources close to its engineering operations suggest the turbocharged 1.4-litre four-cylinder petrol engine used in today’s Golf GTE could be supplanted by a cheaper, naturally aspirated version of VW’s 1.5-litre petrol unit in a move aimed at reducing production costs. The next-generation VW Golf GTI is set to adopt a mild hybrid powertrain that promises to boost performance and refinement while reducing fuel consumption and emissions compared with the recently facelifted current model. The adoption of the 48V electrical system and integrated starter motor on the new hot hatchback is part of the powertrain overhaul across the Mk8 Golf line-up. The changes are also set to make the upcoming model the most powerful series-production Golf GTI yet. Scheduled to go on sale in the UK in 2020, the Mk8 Golf GTI will retain an internal combustion engine: VW’s familiar turbocharged 2.0-litre petrol unit. However, the introduction of the 48V electric system will allow the four-cylinder engine to receive comprehensive modifications. It’s likely that the exhaust gas turbocharger of today’s model will make way for an electrically operated compressor that offers improved low-end response and a broader plateau of torque for added flexibility. Although there are still some time to go before the new Golf’s introduction, VW says it has already locked in the car’s design, which has been developed under the guidance of the company’s latest design boss, Michael Mauer, who was responsible for the styling of the current Porsche line-up. Key styling features described to Autocar include a thin horizontal grille bookmarked by smaller angular headlights than those in use today, with a distinctive LED daytime running light graphic. The new car is also said to have more pronounced wheel arches and a heavily defined side swage line, in combination with typically wide C-pillars and a relatively upright tailgate. 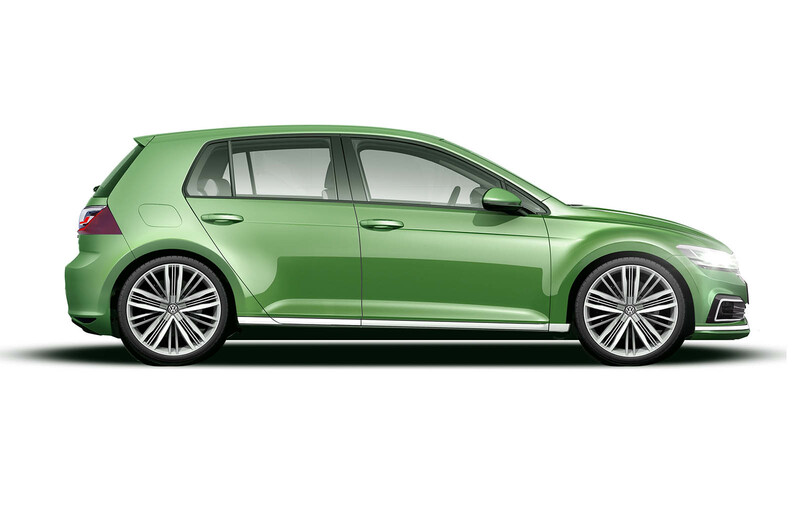 VW plans three bodystyles: three-door hatchback, five-door hatchback and estate. There are no plans to develop a successor to today’s cabriolet model. With a moderate increase in track widths at the front and rear, along with a slightly longer wheelbase and reduced rear overhang, the new Golf is said to offer greater interior space than the current car. As with the exterior, the cabin has been designed to be familiar to existing Golf owners. The standard specification is set to include analogue instruments and controls but, as with the recent facelift of the current model, there will be options of high-definition Active Info Display digital instruments and a central touchscreen infotainment monitor. Also planned are new gesture and conversational speech control functions, in combination with connectivity and networking features currently being pursued by VW’s digital boss, Johann Jungwirth. Other systems will include autonomous driving functions that are also a feature of the recent facelift.